Japanese Episode DP 183: "The Curtain Rises! The Shin'ou League Suzuran Conference!!" American Episode 1326: "League Unleashed!" Now that Satoshi knows his first opponent, he spends a sleepless night trying to decide which pokemon to choose for their upcoming match. The next day, Satoshi and Naoshi meet on the battle field for their first match. Naoshi sends out his Roserade, so Satoshi chooses Mukuhawk as his first pokemon. Roserade surprises Satoshi by being able to dodge Mukuhawk's attacks and getting in a few hits, but the flying type pokemon is able to win with a powerful Brave Bird attack. 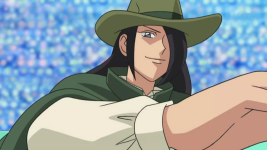 Naoshi's next pokemon is Armaldo. The rock-type pokemon uses Rock Blast to one hit KO its weakened opponent, forcing Satoshi to call out his next pokemon. As the battle rages on, Jun finds Takeshi and Hikari in the audience and tells them a rumor he heard about a trainer who won his first match using only a Darkrai. The battle below wraps up as Satoshi uses his Magmarashi to knock out Armaldo with a Tsubame Gaeshi attack before succumbing to its own injuries and falling over. The final match-up is between Naoshi's Korotoc and Satoshi's Heracross. Korotoc starts the match by putting Heracross to sleep with its Sing attack, but its opponent catches it off guard by using Sleep Talk to hit it with a Focus Punch attack. Naoshi tries to use Sing one more time, but Satoshi's Heracross uses Megahorn on the ground and tears through the earth with its Horn Attack to envelop Korotoc with a massive burst of energy. When the smoke clears, Korotoc is unconscious, making Satoshi the winner! Later, Naoshi announces that he's setting off for another journey and bids Satoshi and his friends farewell. With that, Satoshi looks ahead at the remaining opponents and wonders what the future has in store for him. The Shin'ou League begins in earnest with this episode, and it's...alright. I pretty much liked all the non-battle parts of this episode. I love scenes like the ones in the beginning where Satoshi is planning for his match because it shows us just how much he's grown as a trainer. It also helps the pacing, I think, to show things like Satoshi worrying about what he's going to do in the league because if they had just jumped right into the battles, the entire league would have gotten off on the wrong foot. I also really loved Kouhei in this episode, especially the way he left at the end of the match. His exit was, by far, the best part of this entire episode. The B-plot involving the Rocket-Dan was alright, but I find myself a little creeped out by the trio's new boss, Shimako. Not because of anything she actually does, because in that regard she's fairly uninteresting. No, the part that freaks me out is how she looks, particularly how she doesn't look like any other human character in this show. Her character design is pretty inconsistent with the rest of the women in this show, and it freaks me the hell out. Her head is this weird mixture of facial features that don't quite seem to fit, and the fact that she never really moves that much only draws more attention to this. The league battle was OK, I guess. I really don't give two craps about Naoshi as a character or as a rival to Satoshi, but the pokemon side of the match could have been so much better if they had showcased different pokemon. Why, for example, wasn't the main battle of the episode between Armaldo and Magmarashi? The fire porcupine only just evolved after nearly a decade of being stuck as a Hinoarashi, yet they get rid of it in a quick 30 second battle where it (inexplicably) knocks itself out? The battle between Heracross and Korotoc was pretty decent with the use of Sleep Talk and all, but the way Magmarashi gets shafted in this episode kind of overshadows all that. Even though TPCI have been dubbing this show for almost four years now, this is only their first Pokemon League since they've taken control of the franchise. Accordingly, we get a new league announcer voice, and it doesn't have nearly the same amount of excitement as 4Kids' voice did. Speaking of TPCI, I think I've come up with a new drinking game: take a shot every time a Team Rocket members utters the phrase "pinch us a primo Pokémon" or every time a character shouts out "NOOOOOOO~!!!" after watching his or her pokemon being hit by an attack. I guarantee you'll be drunk in no time. Saikoh Everyday! Band Version replaces Saikoh Everyday! as the opening theme, while Kimi no Mune ni La La La replaces Dotchi ~ Nyo? as the ending theme. I think it's weird that they bothered to change both of them when we only have nine episodes left in the series, but whatever. Brock: "We know what Nando uses. Bug and grass types. So ice, fire, and flying type moves will give you a good advantage." Ash: "OK! So that means I should choose from Glalie, Infernape, Staraptor, or Swellow then, right?" Satoshi also mentions Magmarashi as a pokemon who would be effective against a bug or grass type, but the dub leaves this out. I guess they couldn't fit it in or something? If they were going to omit a pokemon's name because of mouth flap reasons, though, I wish it had been someone other than Magmarashi. Ash, Dawn, and Brock: "Huh?" Paul: "Every Trainer competing here at the Sinnoh League has won eight badges. Giving it all you've got means nothing." Shinji originally calls Satoshi naïve, saying that he's going to need more than just high spirits to beat the experienced trainers who have gathered on Suzuran Island. About the only thing the dub keeps the same here is Paul's mention of everyone winning eight badges. James: "Yummy Octillery snacks! Swablu cotton candy! Bronzor rice crackers, and a Solrock bean bun only add to the fun!" The food translations here are surprisingly good, especially for this show. The "Octillery snacks" were originally "Octank-yaki," a play on the real world takoyaki. "Swablu cotton candy" was the same. The "rice crackers" part of "Bronzor rice crackers" is a pretty decent translation of senbei, and the "bean bun" part of "Solrock bean buns" is, likewise, a decent translation of manjuu. James: "Customers won't have hungry tummies if they're being strong-armed." Meowth: "Happy folks are hungry folks." Nyasu's line in the original is that okyaku-sama wa kami-sama nyaa (お客様は神様ニャー), or "The customer is God." It's basically the Japanese equivalent of "the customer is always right" or "the customer is king," but TPCI chose to ignore this easily translatable line and just have Meowth say something random instead. Announcer: "Most of our first round battles are now history. Let's look at some of the winners. First, we have Paul, who swept his match three to zero." The dub makes the coverage of Paul's victory seem like part of a "best of" showcase, but the Japanese version doesn't give off this vibe at all.